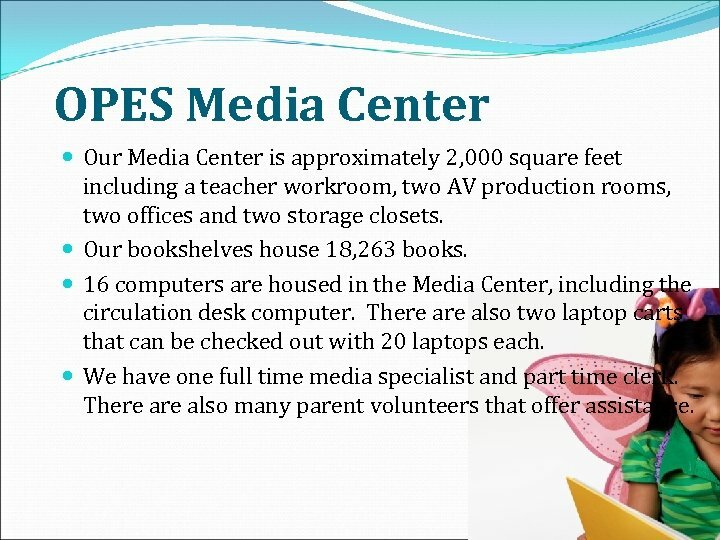 OPES Media Center Our Media Center is approximately 2, 000 square feet including a teacher workroom, two AV production rooms, two offices and two storage closets. Our bookshelves house 18, 263 books. 16 computers are housed in the Media Center, including the circulation desk computer. There also two laptop carts that can be checked out with 20 laptops each. We have one full time media specialist and part time clerk. There also many parent volunteers that offer assistance. 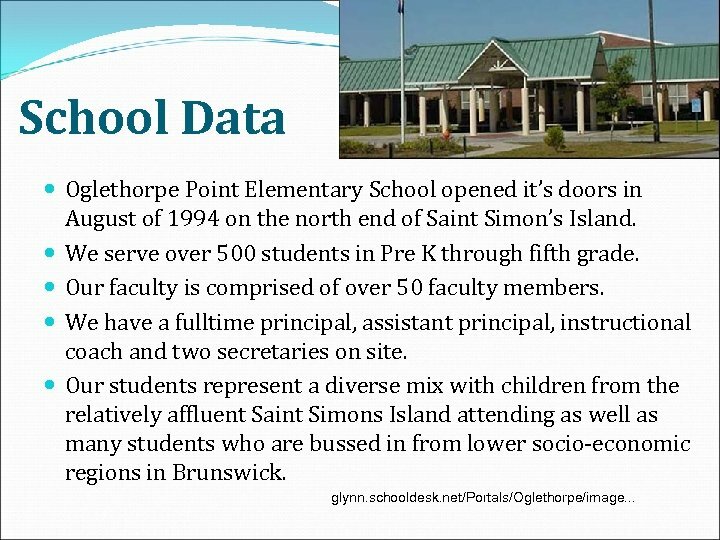 School Data Oglethorpe Point Elementary School opened it’s doors in August of 1994 on the north end of Saint Simon’s Island. We serve over 500 students in Pre K through fifth grade. 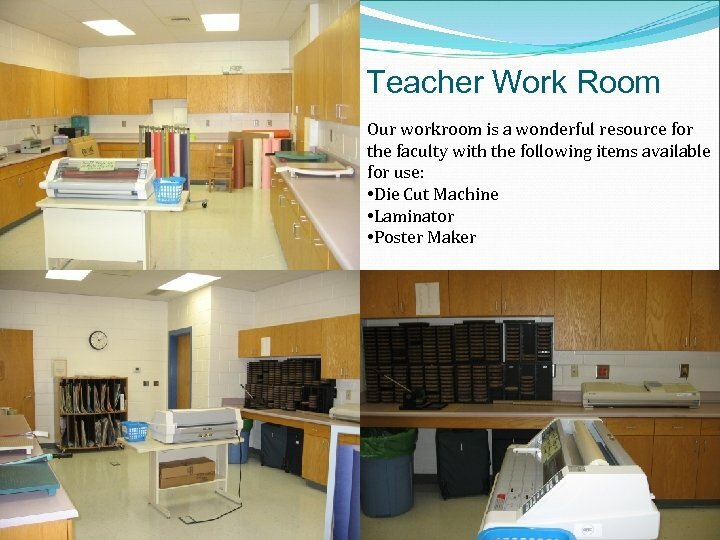 Our faculty is comprised of over 50 faculty members. We have a fulltime principal, assistant principal, instructional coach and two secretaries on site. Our students represent a diverse mix with children from the relatively affluent Saint Simons Island attending as well as many students who are bussed in from lower socio-economic regions in Brunswick. glynn. schooldesk. net/Portals/Oglethorpe/image. 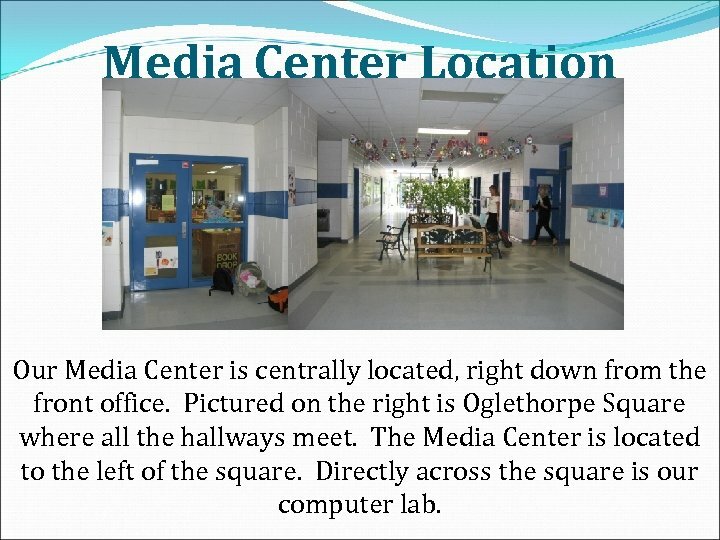 . .
Media Center Location Our Media Center is centrally located, right down from the front office. Pictured on the right is Oglethorpe Square where all the hallways meet. The Media Center is located to the left of the square. Directly across the square is our computer lab. 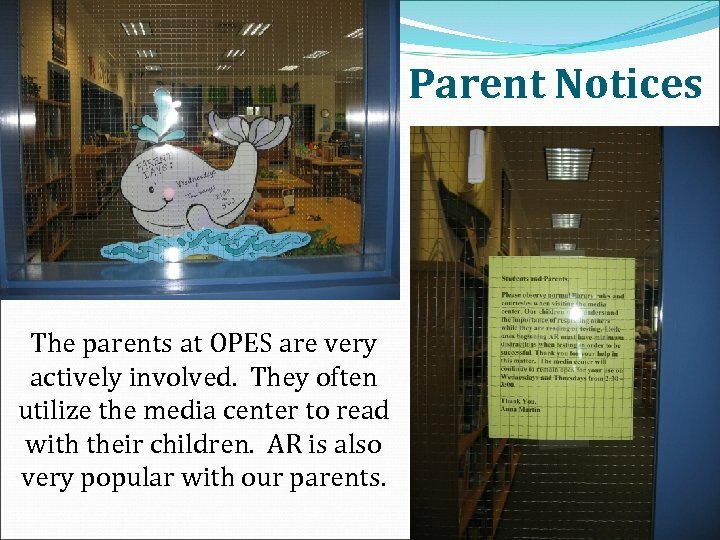 Parent Notices The parents at OPES are very actively involved. They often utilize the media center to read with their children. AR is also very popular with our parents. Whole Group Area As you enter the Media Center you see our whole group area with enough seating to hold an entire class for instruction, although it is rarely used for that purpose at this time. Whole group area looking towards the stacks. 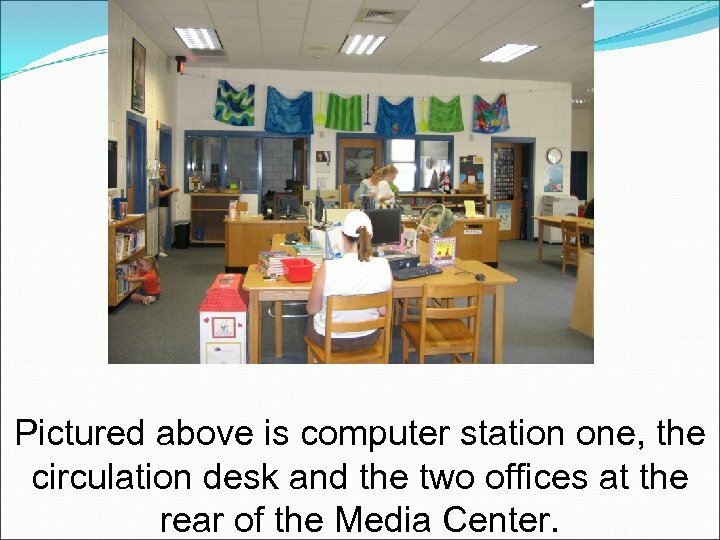 Pictured above is computer station one, the circulation desk and the two offices at the rear of the Media Center. • Two storage closets are pictured above. • The on the left holds additional equipment and older periodicals. • The closet on the right houses videos and serves another function as the AV production room for our morning news show. Pictured above is one of two very welcoming seating areas. 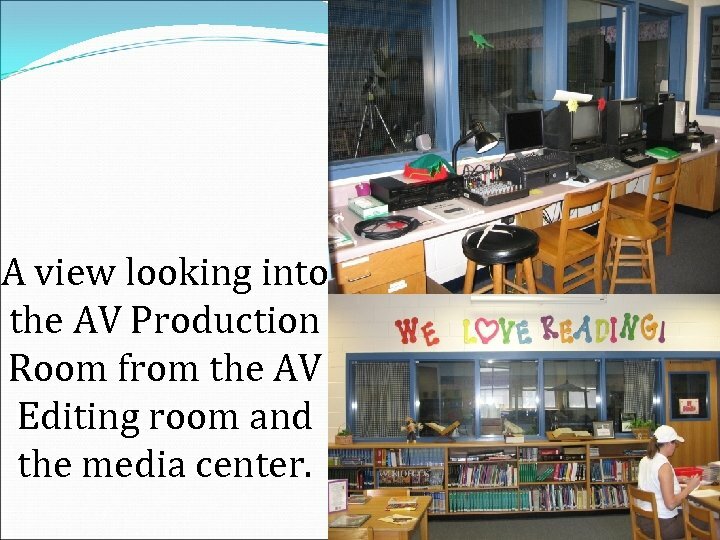 • Pictured above is our wonderful AV Production room, there are windows looking into this room from the front hallway of the school as well as the media center. 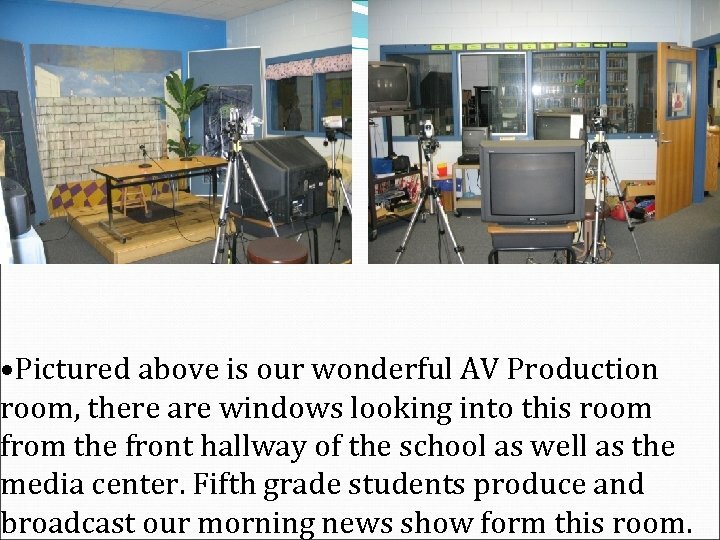 Fifth grade students produce and broadcast our morning news show form this room. A view looking into the AV Production Room from the AV Editing room and the media center. 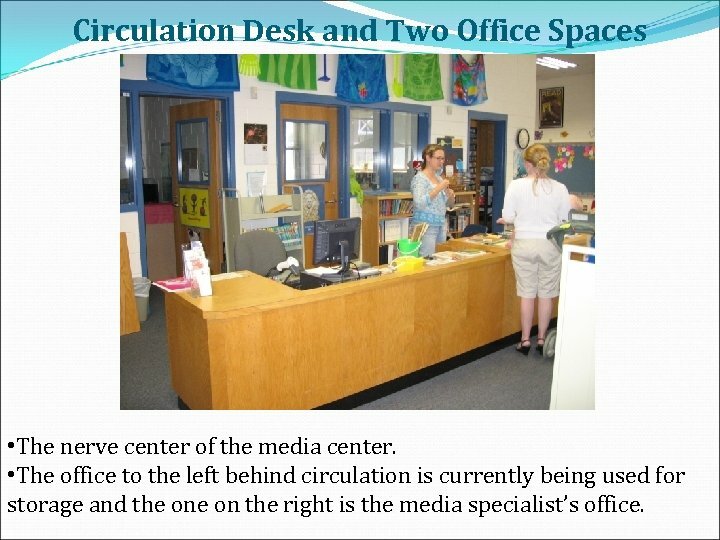 Circulation Desk and Two Office Spaces • The nerve center of the media center. 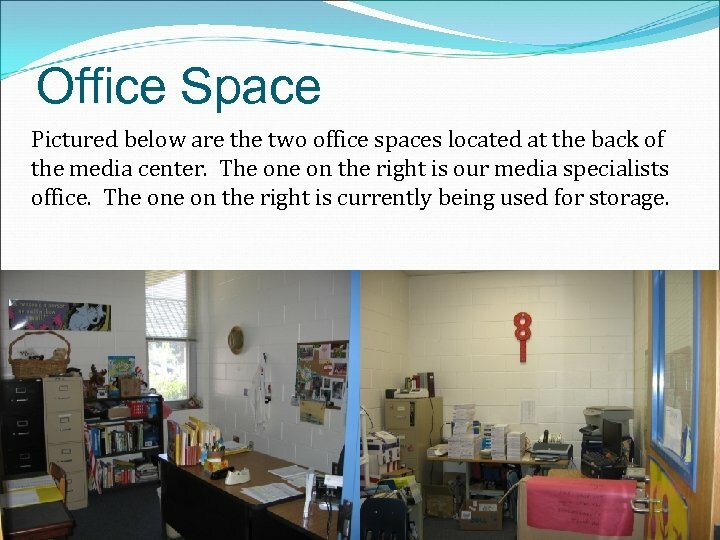 • The office to the left behind circulation is currently being used for storage and the on the right is the media specialist’s office. 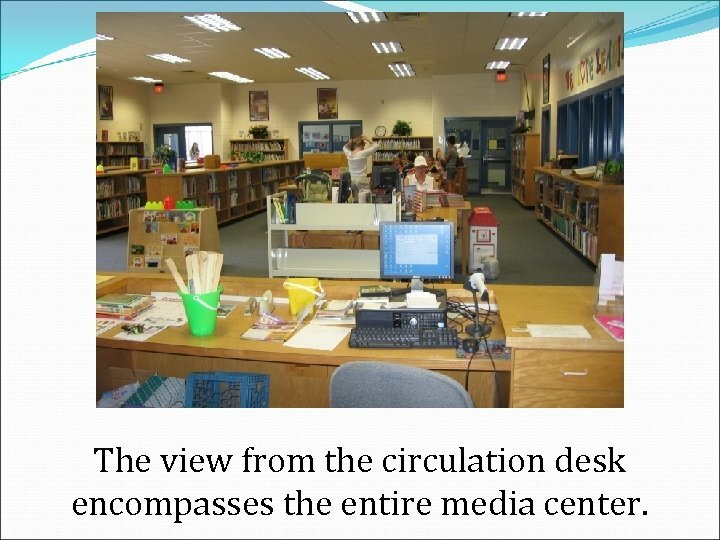 The view from the circulation desk encompasses the entire media center. Office Space Pictured below are the two office spaces located at the back of the media center. The on the right is our media specialists office. The on the right is currently being used for storage. AR Promotion Two displays devoted to AR Promotion in the media center. The photo on the left shows our progress towards our reading goal. The photo on the right highlights AR books available for check out. 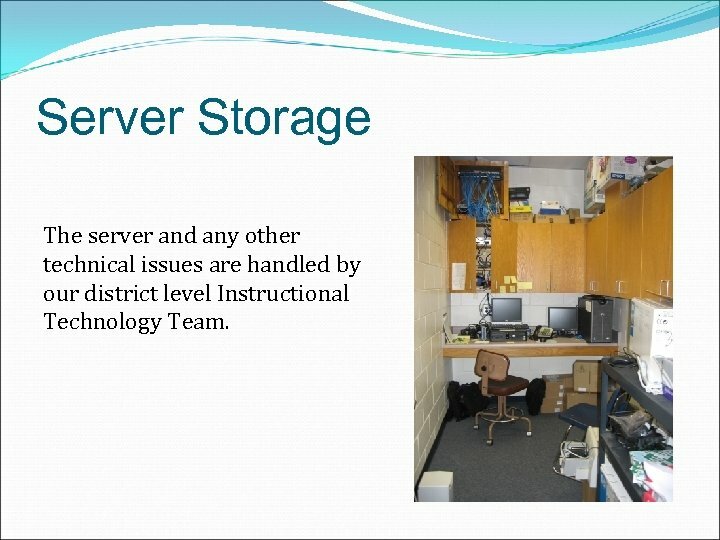 Server Storage The server and any other technical issues are handled by our district level Instructional Technology Team. Story Time Nook This bright, colorful area is used for story time with the students. 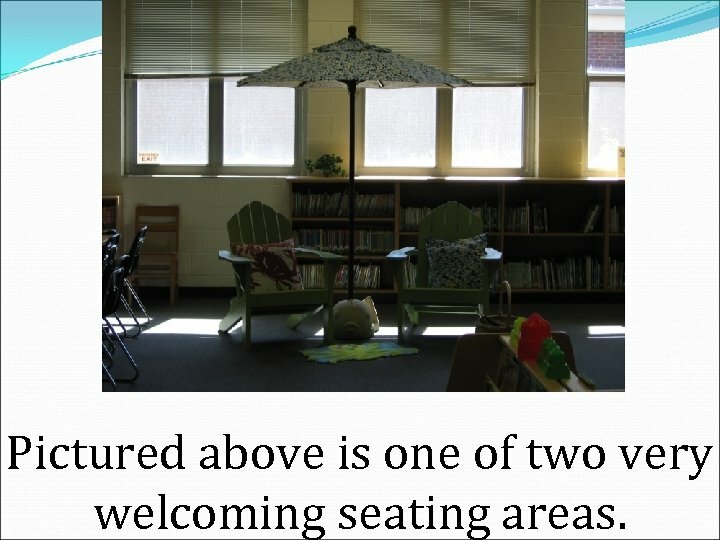 When it is not being used by a class, the soft seating is available for individual students, as pictured in the photo on the left. This is the gathering place of the media center. 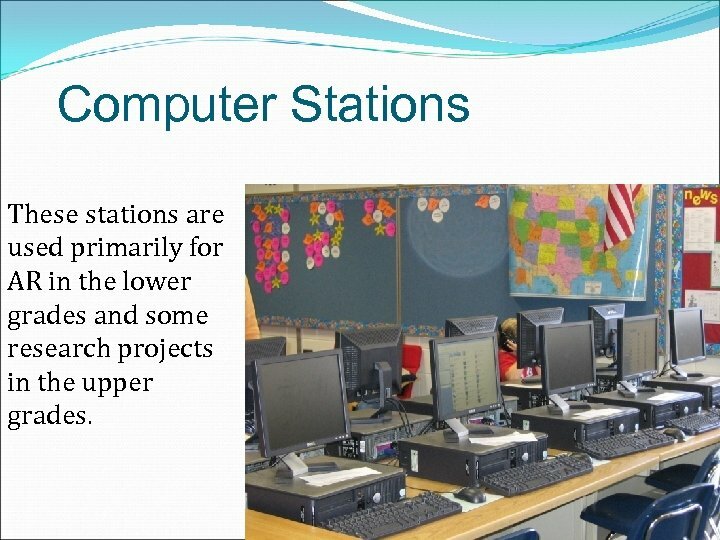 Computer Stations These stations are used primarily for AR in the lower grades and some research projects in the upper grades. 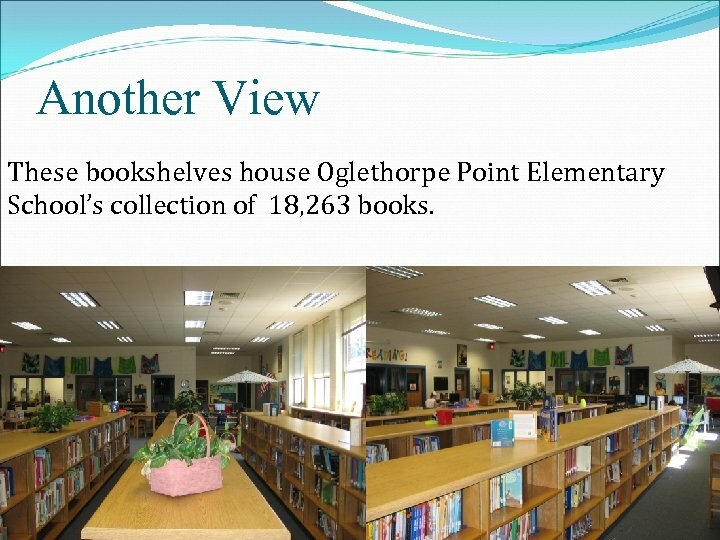 Another View These bookshelves house Oglethorpe Point Elementary School’s collection of 18, 263 books. 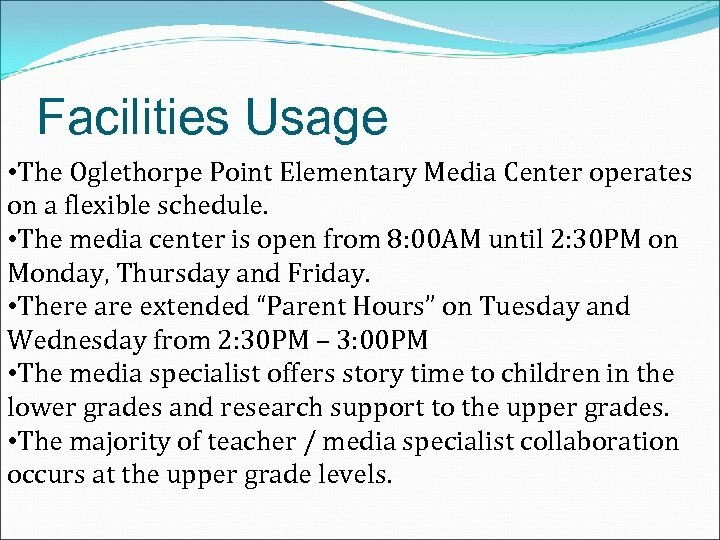 Facilities Usage • The Oglethorpe Point Elementary Media Center operates on a flexible schedule. • The media center is open from 8: 00 AM until 2: 30 PM on Monday, Thursday and Friday. • There are extended “Parent Hours” on Tuesday and Wednesday from 2: 30 PM – 3: 00 PM • The media specialist offers story time to children in the lower grades and research support to the upper grades. 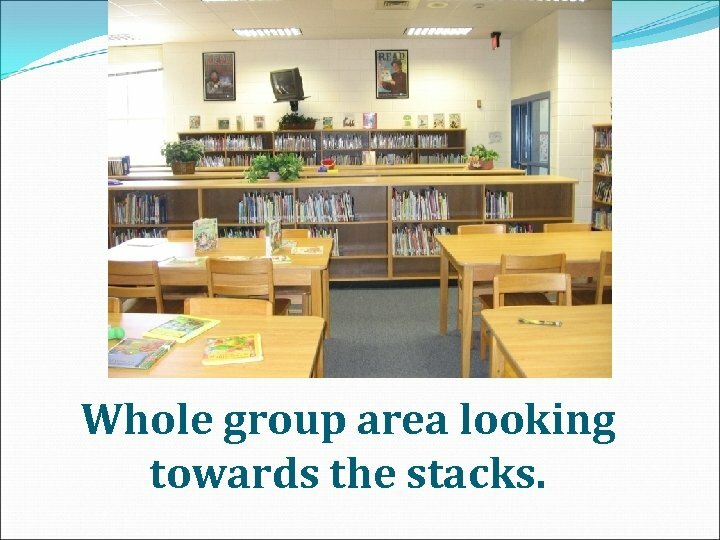 • The majority of teacher / media specialist collaboration occurs at the upper grade levels. 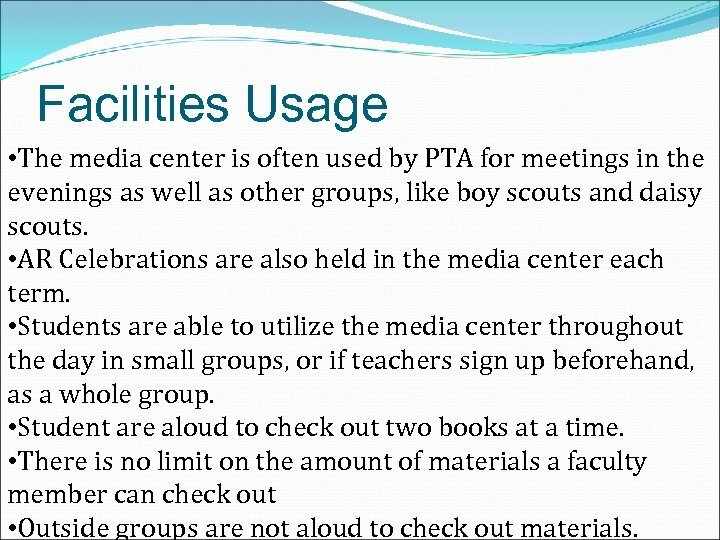 Facilities Usage • The media center is often used by PTA for meetings in the evenings as well as other groups, like boy scouts and daisy scouts. 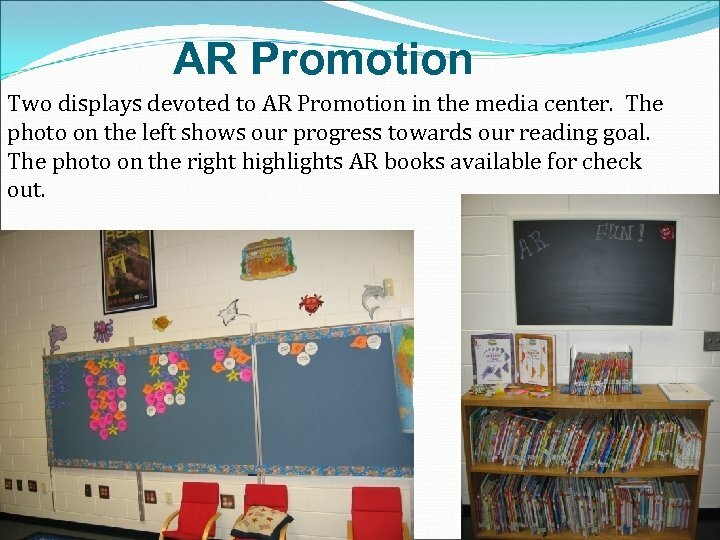 • AR Celebrations are also held in the media center each term. 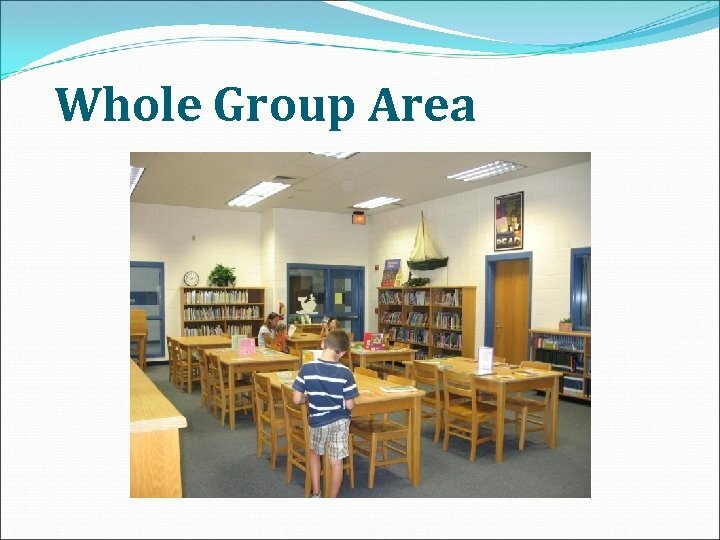 • Students are able to utilize the media center throughout the day in small groups, or if teachers sign up beforehand, as a whole group. • Student are aloud to check out two books at a time. • There is no limit on the amount of materials a faculty member can check out • Outside groups are not aloud to check out materials. 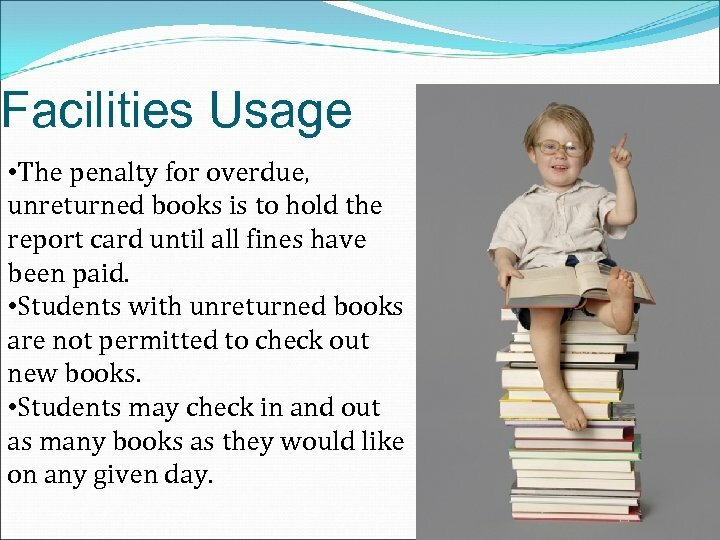 Facilities Usage • The penalty for overdue, unreturned books is to hold the report card until all fines have been paid. • Students with unreturned books are not permitted to check out new books. 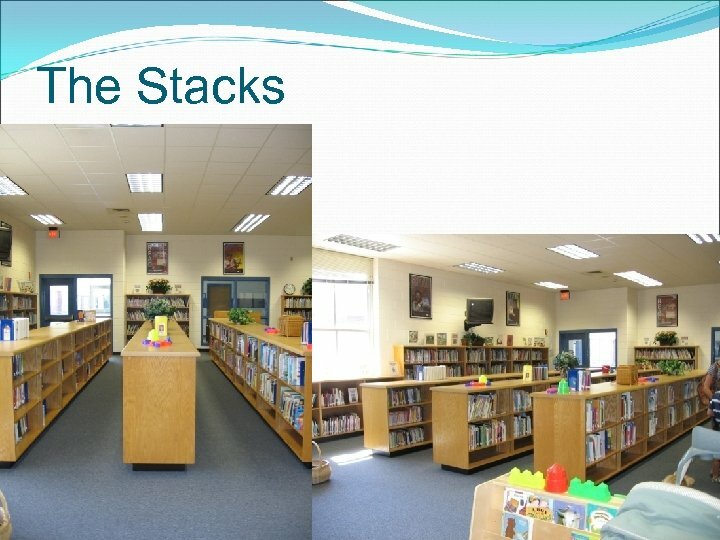 • Students may check in and out as many books as they would like on any given day. Survey Results The teachers, media specialists and students surveyed agreed that we should have more direct instruction in our media center. 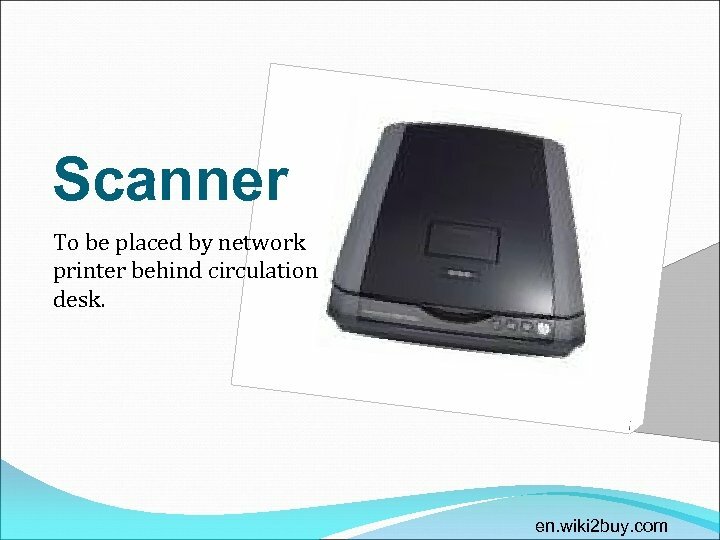 The teachers all agreed that we need a scanner and a copier available in the media center. 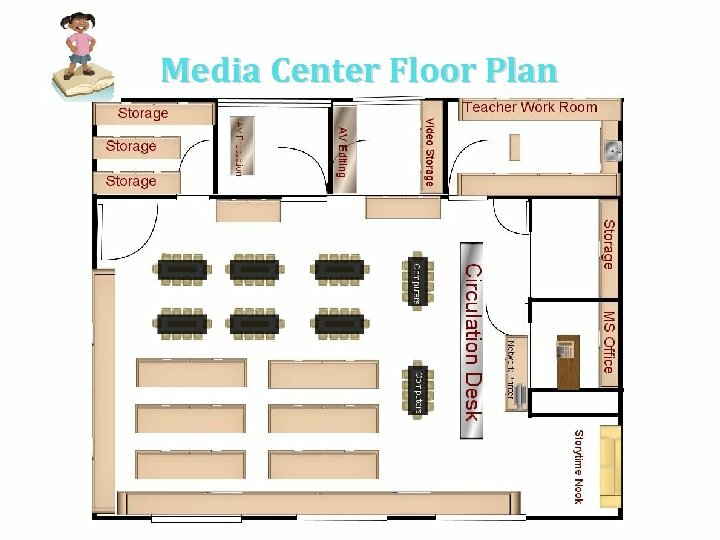 Both teachers and media specialists felt that a private conference/collaboration/small group room would be quite beneficial for planning and instruction. 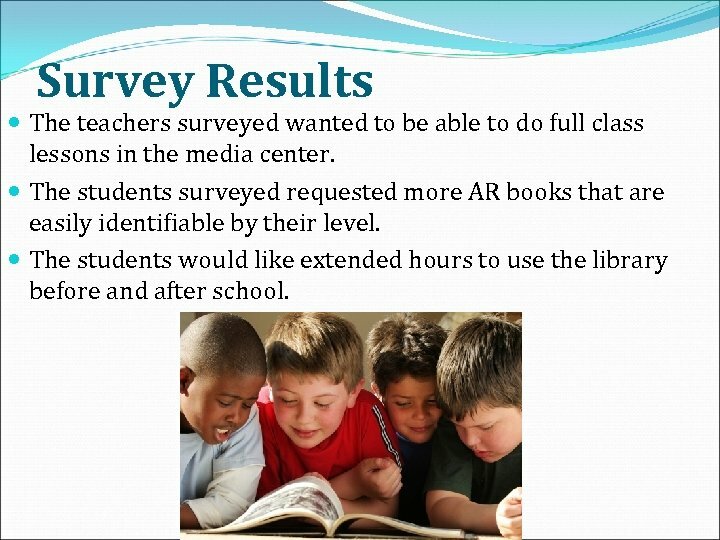 Survey Results The teachers surveyed wanted to be able to do full class lessons in the media center. The students surveyed requested more AR books that are easily identifiable by their level. 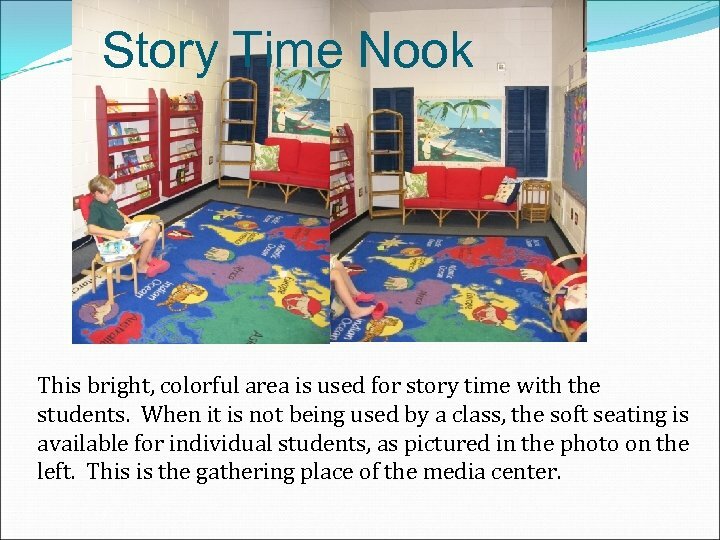 The students would like extended hours to use the library before and after school. 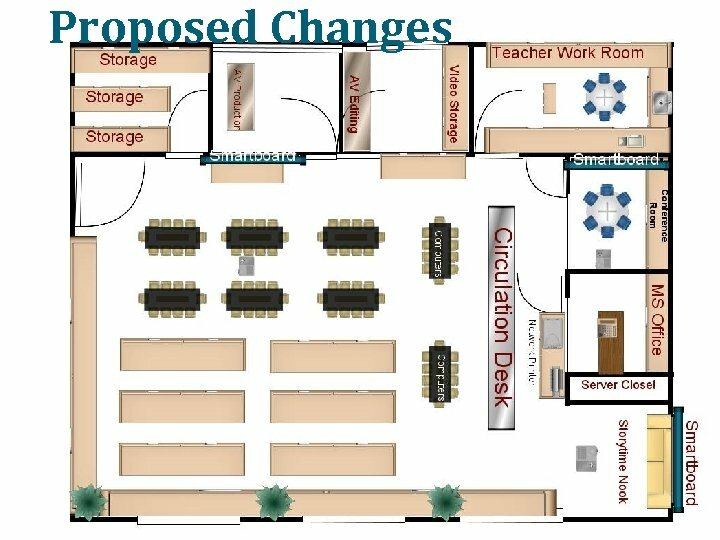 Proposed Changes Turn small storage office into a conference room to be used for small group instruction or grade level collaboration. 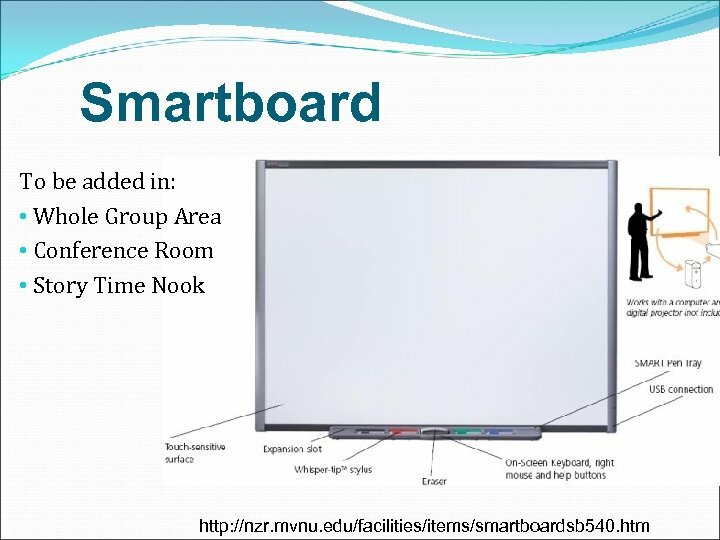 Add Smart Boards and projectors in three locations: whole group work area, story time nook, new conference room to allow for effective direct group instruction. 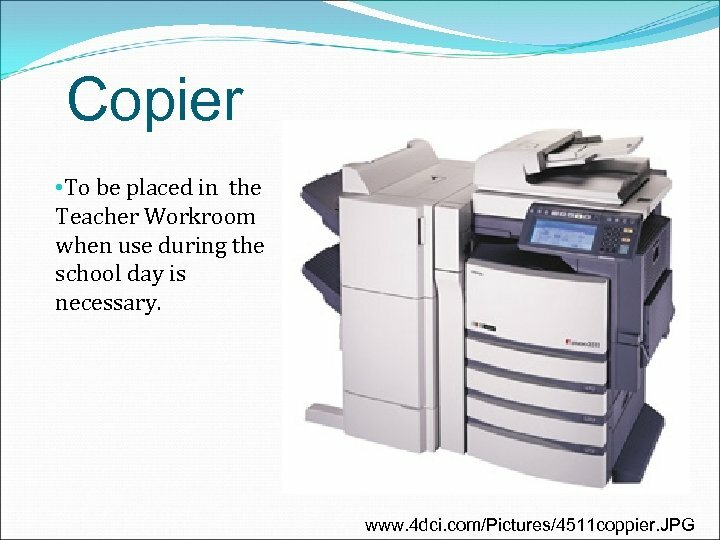 Add scanner to network printer area and copier to teacher workroom for access during school day when needed. 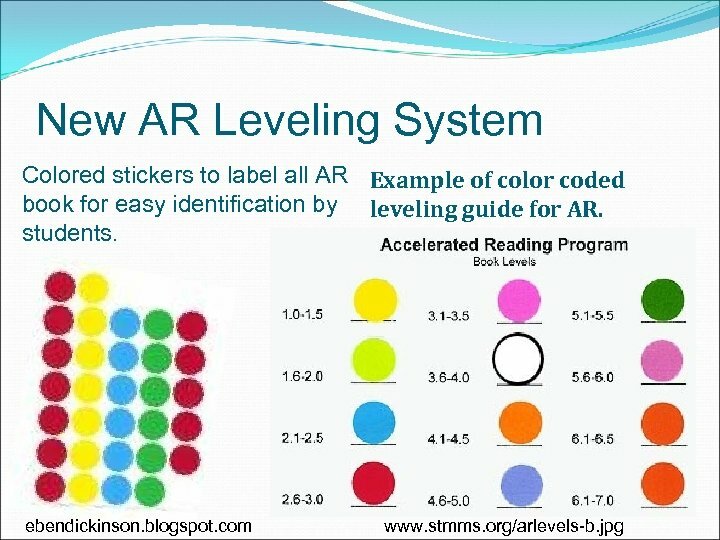 Institute a color coded labeling system for all AR Books. 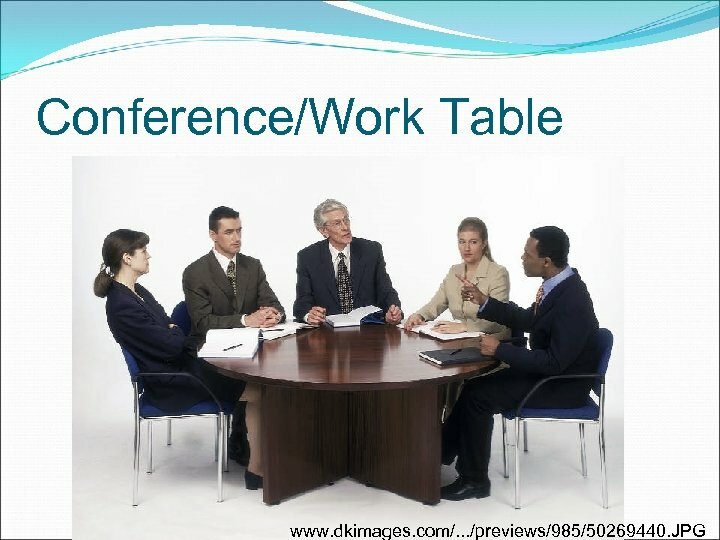 Add table to teacher workroom for workspace and meetings. Add plants around to warm up ambiance. 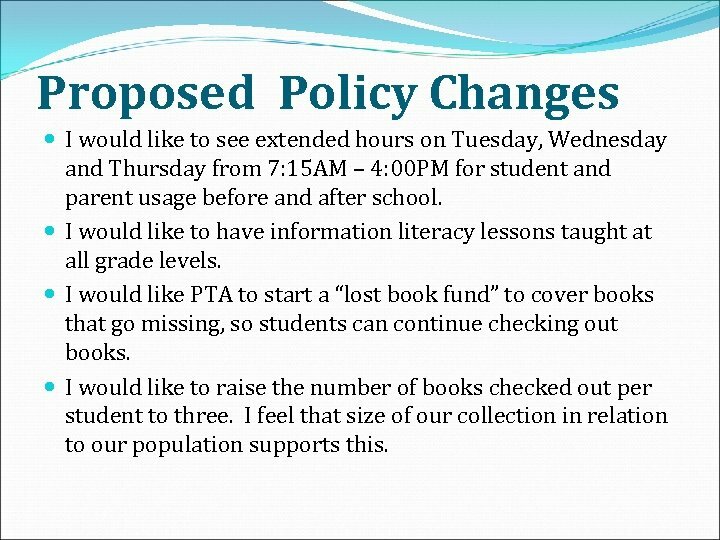 Proposed Policy Changes I would like to see extended hours on Tuesday, Wednesday and Thursday from 7: 15 AM – 4: 00 PM for student and parent usage before and after school. 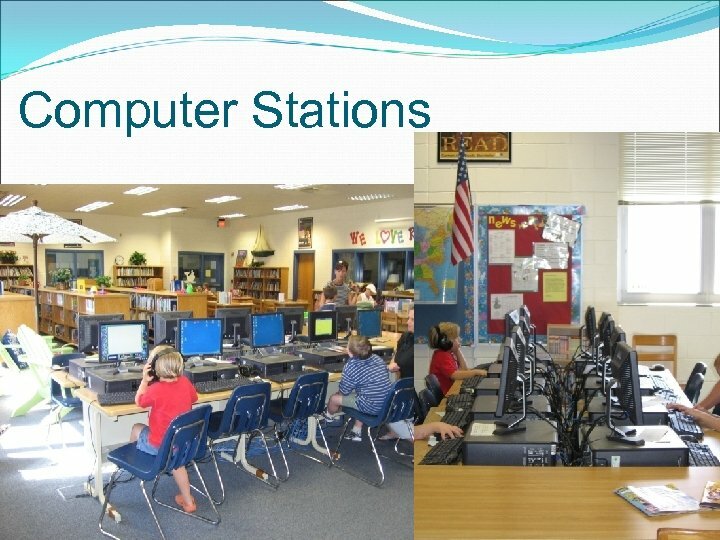 I would like to have information literacy lessons taught at all grade levels. I would like PTA to start a “lost book fund” to cover books that go missing, so students can continue checking out books. I would like to raise the number of books checked out per student to three. I feel that size of our collection in relation to our population supports this. Conclusion In conclusion, I feel that our Media Center is a wonderful facility that offers a warm, inviting environment for our young readers. I enjoyed thinking about the possibilities for this facility very much, and learning what others would like to see happen in our Media Center. I hope to utilize what I have learned in this project in my own Media Center one day.